Firefighters in eastern China rescued an abandoned newborn baby boy lodged in a sewage pipe after he was apparently flushed down the toilet. NBC's Natalie Morale reports. 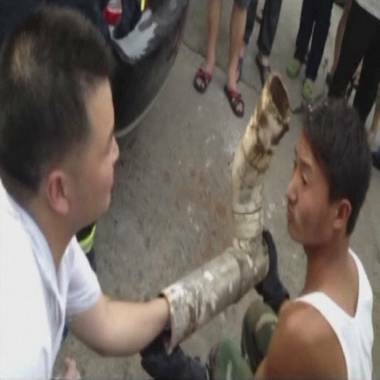 BEIJING – A baby boy believed to be just days old was found in a sewer pipe in a bathroom in China last weekend. According to local media, the startling discovery was made on Saturday in Jinhua City, Zhejiang province. Firefighters were called to an apartment complex where residents said they could hear the baby’s cries through the pipes. Emergency crews who arrived on the scene could see the baby’s head far down inside the toilet duct, but were unable to reach down far enough into the 4-inch in diameter pipe to pull him out. Rescuers had to walk down one floor below to cut the pipe free. After removing the section of pipe containing the baby, firefighters took him to a nearby hospital where pliers and a saw were used to gently free him. The child, whose name is unknown, was believed to be just two days old when he was discovered and initially suffered from a low heart rate and labored breathing. He had also suffered numerous bruises to his head, arms and legs. Rescuers try to reach the trapped infant inside a piece of the sewage pipe. Doctors at Pujiang People’s Hospital said by telephone that the baby’s prognosis was good. His heart rate was stabilizing and his breathing was much smoother, they added. Staff also reported that the hospital was paying the boy’s medical bills while donations of clothes, baby formula and other gifts were coming in from the community. Doctors declined to confirm whether the baby’s relatives have come forward. Police in Jinhua City said that they “seemed” to have found the baby’s parents before refusing to speak further. Police there have also said that they were treating the investigation as an attempted murder. On Chinese social media, users expressed their outrage over the incident and called for the parents to be punished. Others though expressed a desire to adopt the young boy. “I am 25 years old and single! Can I adopt him?” asked one user. NBC News’ Huang Pei and Dalin Liu contributed to this report.